The Towering Pile: The Read-a-Thon Approacheth! 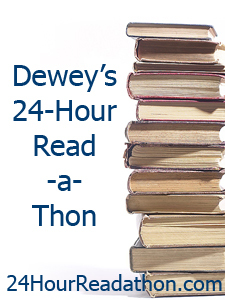 That's right, it's just about time for Dewey's 24 Hour Read-a-Thon! This season's read-a-thon takes place (in my time zone, CST, ie. Winnipeg, Chicago, Mexico City, etc.) from 7:00 am on April 26 to 7:00 am on April 27. I've done every 24 Hour Read-a-Thon since October 2011, which was before I even had a book blog, so I participated on my genealogy blog. It's actually part of what inspired me to become a book blogger! Amazingly, this means this will be my 6th read-a-thon! Crazy! Some years have been more successful than others, but I always participate through the whole day and night, and I always have a great time! I haven't put together a reading pile yet. I'm having trouble deciding! I'm way behind on the Canadian Book Challenge, so I'm trying to squeeze in as many of those as possible, but all my Canadian books seem to be quite long! But I'm sure I'll have a good pile ready by Saturday. Let me know in the comments in you're participating so I can follow your progress!